It is always hard to capture pictures of our students as we lead into the Long Table Dinner, it is just too frantic. But once things calmed down, I found a stack of index cards from our students, describing their most memorable moments from class that week. 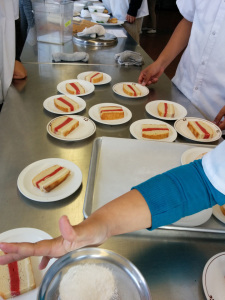 Hands down it was the making (and tasting) of the upside down plum cake for our sixth Long Table Dinner Event on October 23rd. We used a flat of organic Last Chance plums from a local farmer’s market, they were delicious, and indeed the last plums of the season. There is something magical about upside down cake. You have this butter-sugar mixture that you swear will not become caramel. 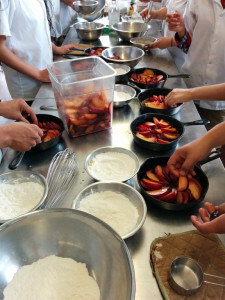 Then you place fruit on top of it, pour cake batter over it and cross your fingers as you slide the pans into the oven. More often than not, the magic of the fruit talks that butter-sugar mixture into melting into a luscious caramel. It is an exciting moment as you invert the still-hot cake and watch this delicious mixture step down from the pan. If the fruit gets stuck to that pan bottom, just coax it out with a metal spatula – it is an easy repair job if you catch it right when it is coming out of the pan. 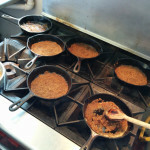 We used smaller cast iron pans (#5), easier to handle when hot. The recipe we used is easy to find (see below), which we adapted here and there, substituting some almond flour and creating a vegan version, using almond milk and applesauce for the dairy. And for those wheat free guests? 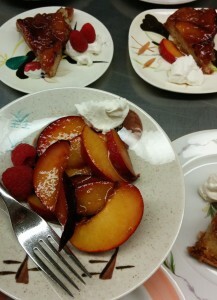 We sliced fresh plums, tossed them in sugar and lemon juice, garnishing with dollops of cream. 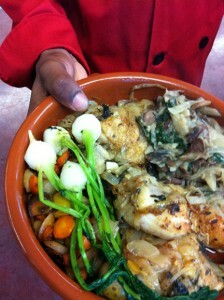 Link to Simply Recipe’s original recipe is here, with our gratitude! 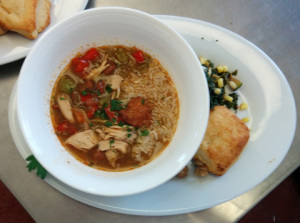 Gumbo. 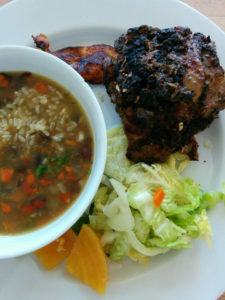 Simple Good Food. Our class has been working together over the last 6 weeks and you could feel the self accomplishment in yesterday’s class. 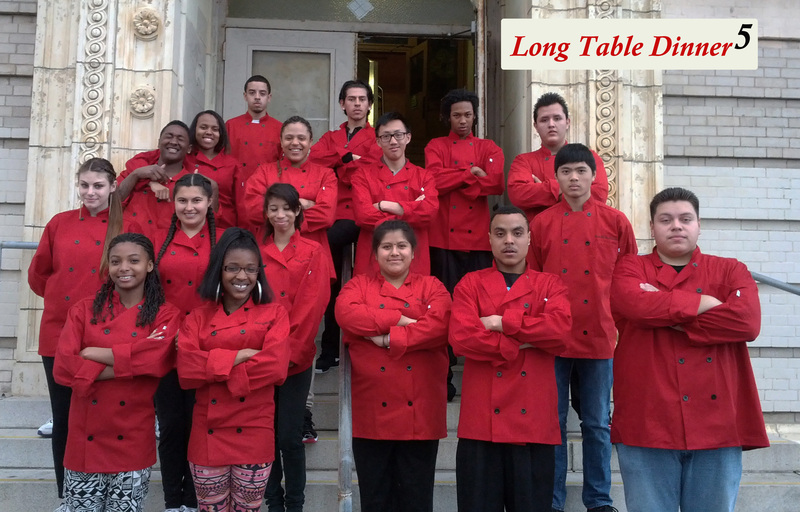 Now we set our sights ahead, to our next Long Table Dinner, Thursday October 23rd, please save the date! Ida B. 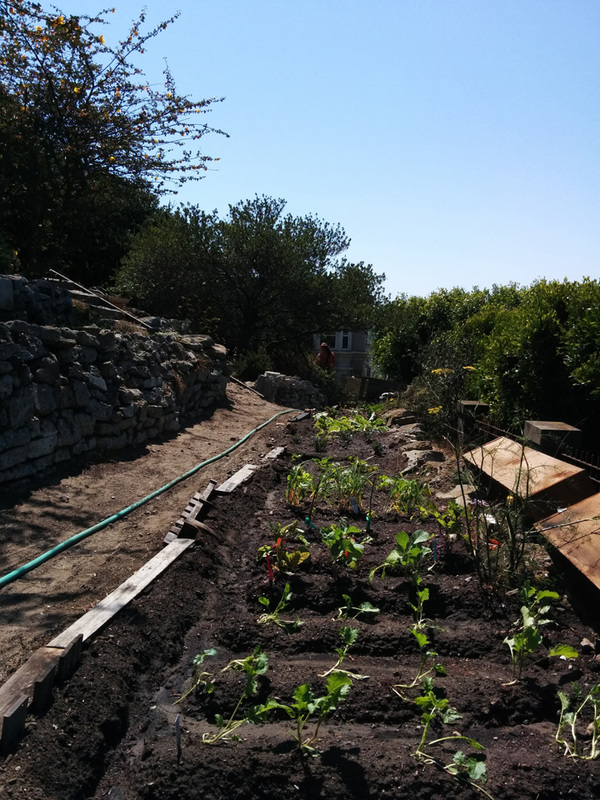 Garden, Labor Day 2014, with thanks to Stephen S. – and RiverDog Farm! A beautiful Indian summer day. Generous, neighborly friends. Digging and watering. 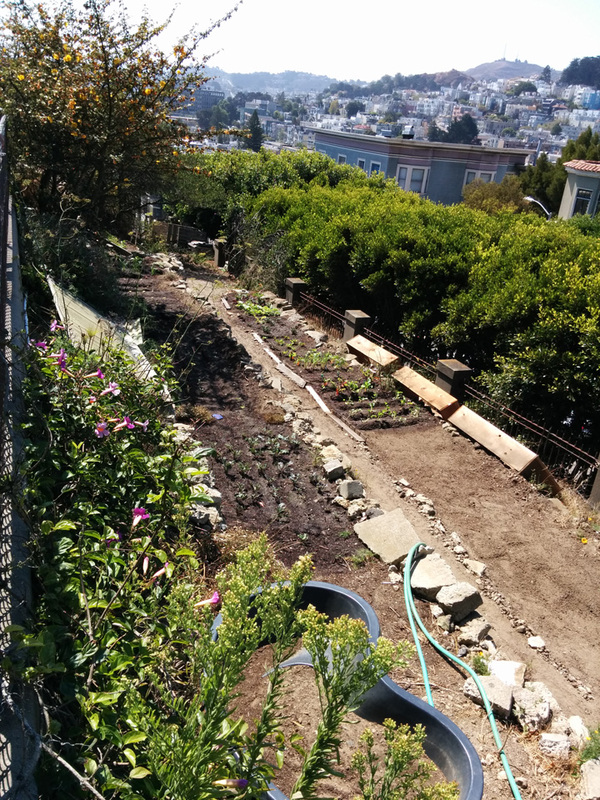 Our garden is taking shape thanks to many people, some of whom I haven’t even met – yet. Thank you, friends. We are entering into our 3rd week of school and now that the “back to school” social excitement has pretty much run its course, it is interesting to see students in class turning towards getting down to real work. The biggest barriers many of them have are often around trust – trusting one’s self most of all, especially when you are doing something you’ve never done before. I know how that feels when I’m in the garden. I’ve planted plants, but never seriously helped grow food before. I’m not sure what the final results will look like, and there are many influences that I can’t foresee and that I don’t have any control over. Toto, I don’t think we’re in my familiar kitchen environment anymore. Trust aside, I am also realizing that once you get started, growing food has a magnetism – you want to see how those plants are doing, which on this weekend, feels much like that wonderful feeling my great grandmother used to describe when you know there is a good book waiting for you at the end of the day. Now I want to visit the garden to see what is waiting there too. How lucky we are to have this luxurious chance to learn in this way, with a safety net of great farmers not far from us should our yield fall short. 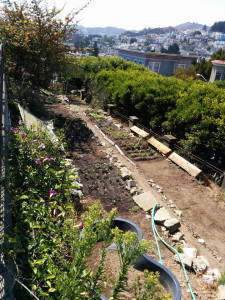 Meanwhile, our class will be getting our teamwork and cooking skills together so that when this garden is producing, we will have a rare chance to harvest, cook and serve this delicious fare to ourselves and perhaps also to our Long Table Dinner guests… in about 8 weeks, I trust. Right before serving Long Table Dinner 5. I don’t normally post pictures of my students, we are simply too busy. Now that it is “Spring Break,” I should have my feet up, not be plowing away at the computer, right? I am luxuriating in my own way though, listening to the rain with an extra strong pot of tea and some (still warm) chocolate cake. All I can think of is how proud I am of my students. Our young people (everywhere) are facing huge challenges and no matter how different we may seem, how different our stories may be, at our core we have the same basic needs. In our multi-screen based world, young people are growing up not only never having cracked open an egg, but more importantly, not knowing how it feels to be a part of something and the sense of accomplishment that comes with it. This is what being a part of something and accomplishing looks like. 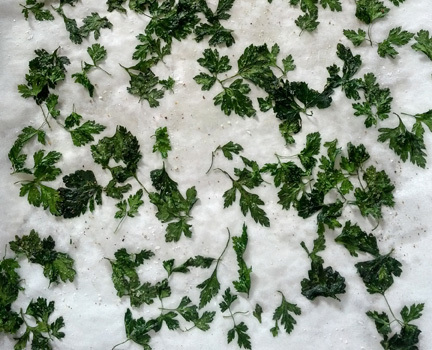 Heat of the Kitchen is coming up to a few crossroads in 2014. We’ve been truly lucky to have the kind of support we’ve had – it has allowed us to keep our “work simulation” classes going, even though they don’t fit into familiar educational models. 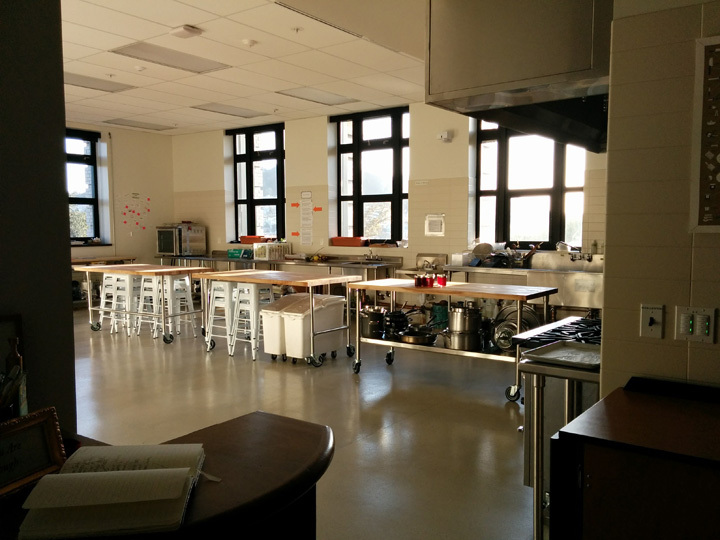 In this place we have created, where education and industry are thrown into the same room (with sharp knives and hot surfaces), it is important to remember why we are doing it the way we are. Because it is real, it is valued by our students, and it creates a lasting, common bond. Expect more on our views, here and on Nopalize, as we move forward. Thank you for your support! They put salt AND ground black pepper on them before baking. Next up: we were given these oranges, 2 cases of little sweet mandarins. 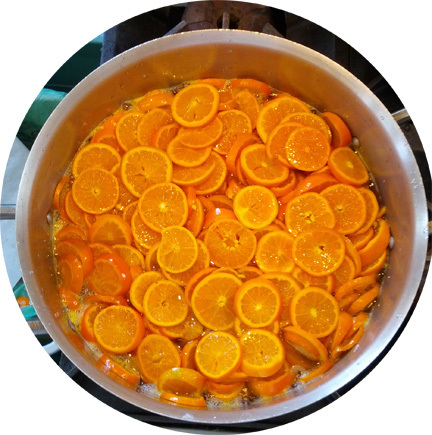 The peels were very tasty too so we made them into candied orange slices. 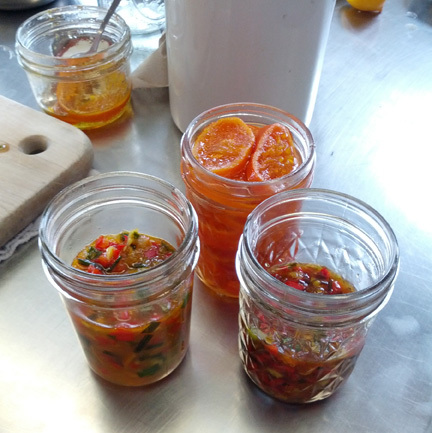 I love making marmalade, but it is, frankly, a labor of love. So much work! These sliced up fairly well and took to being simmered in sugar syrup quite happily. 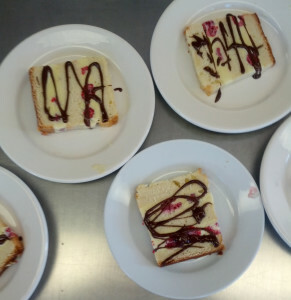 It is great to witness the students getting excited about experimenting with recipes and enjoying the results. 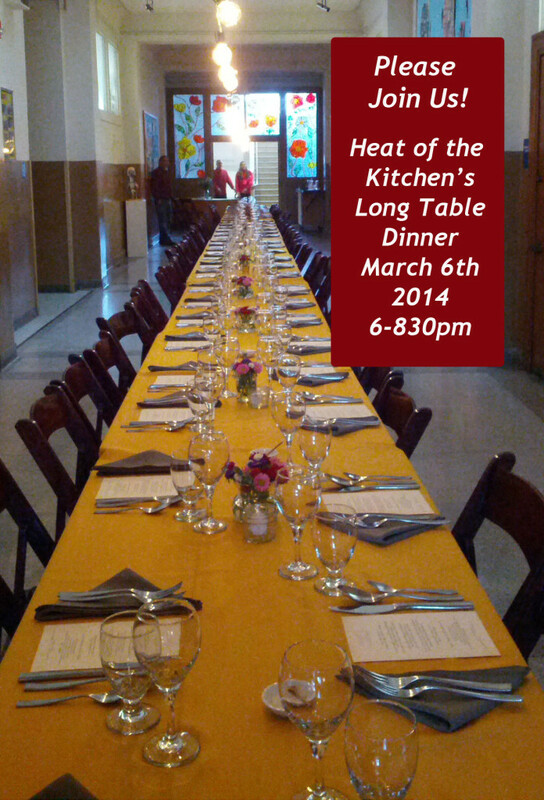 Even though the Long Table Dinner is sold out, let us know if you want us to share any of the recipes. A super special thank you to all of those who have been helping us get ready and get the word out. We are so grateful!!! LTD 5: It’s happening March 6th! It seems like we just started the year, right? But you can’t keep our students from it. We are cooking up a storm. We took some time this week to work on a little hand cut pasta, and on making really good chicken broth. But we were also working on our teamwork in ways we hadn’t yet this quarter. Students impressed us with how they came together as a team with group awareness and efficiency. This may have also been because many students committed to working the Long Table Dinner this week …exciting! It added a delicious real world focus to our work. Success all aro und. 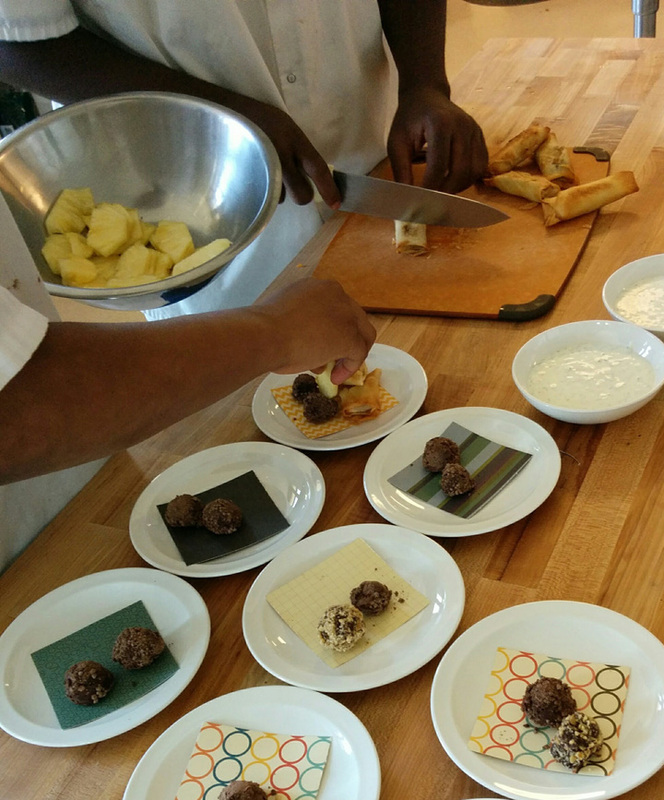 Counting ourselves lucky as we get to cook in our first week back, thanks to our students being ready to try completely new things to them, and keep an open mind. 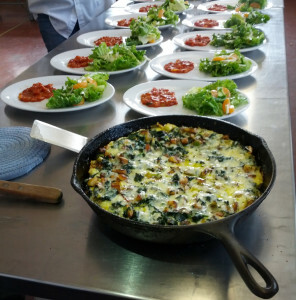 Frittata over tomato sauce, salad and biscotti in the first week. With all the dishes clean and put away before that ringing bell. 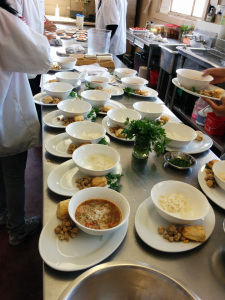 And this time, no full class spent on measuring, no new module on the ins and outs on what it means to be a chef – BAM. You walk in, put on a workshirt, keep your pride of work (each step of the way) and your professionalism going and it is all a piece of cake. Together we can do a lot. And, by the way, there will be no slacking this quarter. We will appreciate the good moments and keep our sense of kindness through our mishaps but we mean business. We are already talking about our next Long Table Dinner, about job shadows and creating some delicious food. Look out people! And save the date to come and enjoy our accomplishments: Thursday March 7th. Long Table Dinner. 6-8pm. More Soon! It is a New Year. Wow. Am I proud of my students. They made and served dinner to a very long table of guests on May 3rd in our central hallway. The experience was absolutely full-on professional. Many of our students heard how proud everyone was of them too. Some students were even a little concerned, as if the accolades were based on how they behaved, not what they achieved. But our success was not based on behavior or manners, it was based on something much stronger. There is a lot of strength in putting all of your combined efforts together to create true hospitality. Perhaps schools don’t experience this enough. Together we can create more than the sum of our parts. We create that “magic” in the room, the reason why many restaurant owners take those huge financial leaps to provide a place where people can go and get fed in so many ways. When your guests have truly enjoyed their experience, it gives you this wonderful feeling, much more than satisfaction. There is a great deal of value to being a part of that kind of group effort and accomplishment. 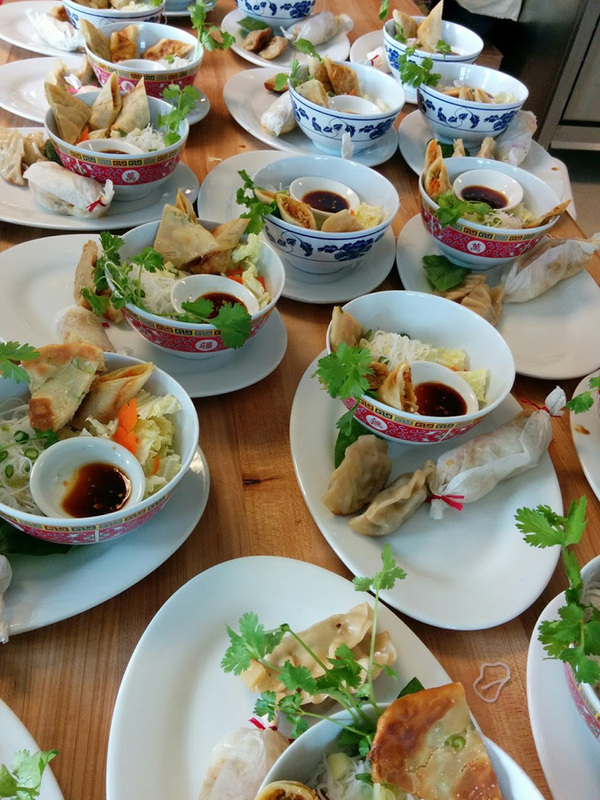 Thank you everyone involved with our first Long Table Dinner. More pictures soon, as we look forward to our next one in October!